Bison Steak Recipes --Did You Know Bison has Less Fat Than Skinless Chicken? You're looking for bison steak recipes. OK, but first a riddle. Why Did the Chicken Cross the Road? And what did the chicken find? She found (alas!) bison steak recipes have only 1/3 as much fat as that plump little chicken. Chicken-lovers have reason to lament. Health conscious consumers have plenty of good reasons to shout! 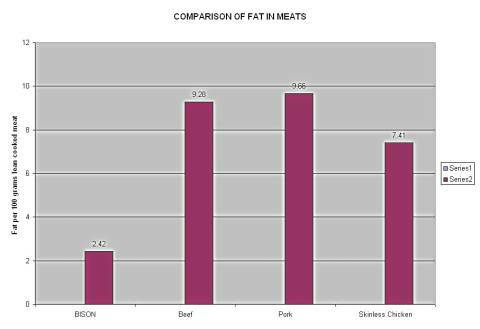 As seen in the chart below, bison has only ¼ the fat of beef, 1/4 the fat of pork and 1/3 the fat of chicken. (Although it's not on this chart, bison also has ½ the fat of turkey.) Amazing! Now this will really blow your mind. The USDA data are based on samples taken from retail stores around the country. There is no indication the animals were exclusively grassfed. Most likely those bison were grain-fed prior to slaughter. As a result, grassfed bison steak recipes will be EVEN LOWER in fat than the figures in the graph indicate. Turn the oven to 170° F. Mix together the salt, pepper, oil and rosemary. Cover both sides of the bison steaks with the spice mixture. Rub mixture evenly into meat. Allow time (up to an hour) for the spices to permeate the bison steaks. Sear the steaks for 2-3 minutes in a heavy skillet at a high heat. Sear both sides. Bake the steaks for about 1 hour 40 minutes for rare, 2 hours for medium-rare. Do not cover during baking. Season steaks on both sides with salt and pepper. Set steaks in heavy skillet with enough oil or melted butter to prevent steaks from sticking. Sear steaks on both sides. Remove steaks and place on serving platter. Into the same skillet or heavy frying pan place onion, bell pepper and garlic. Stir constantly until onion is browned. Add all remaining ingredients. Add water to preferred thickness and stir. Cook this gravy about 3 minutes. Pour gravy over bison steaks, serve hot. Enjoy the taste and aroma. You are in for a treat! Our family raises and sells grassfed meat (lamb) directly to health-conscious consumers. We began direct marketing quality lamb products in 1994. I know the industry inside out. That's why I favor getting grass-fed bison --and other products-- from US Wellness. For quality and consistency, they can't be beat. US Wellness Meats sells quality grassland meat products - Visit them Online!